When Harvey and Irma Schluter said “I do,” Franklin D. Roosevelt was president of the United States, the cost of a new car was $920 and former heavyweight boxer Muhammad Ali was about 2 months old. Fast-forward to Sunday, when the pair celebrated a milestone most married couples could only dream of: 75 years together. 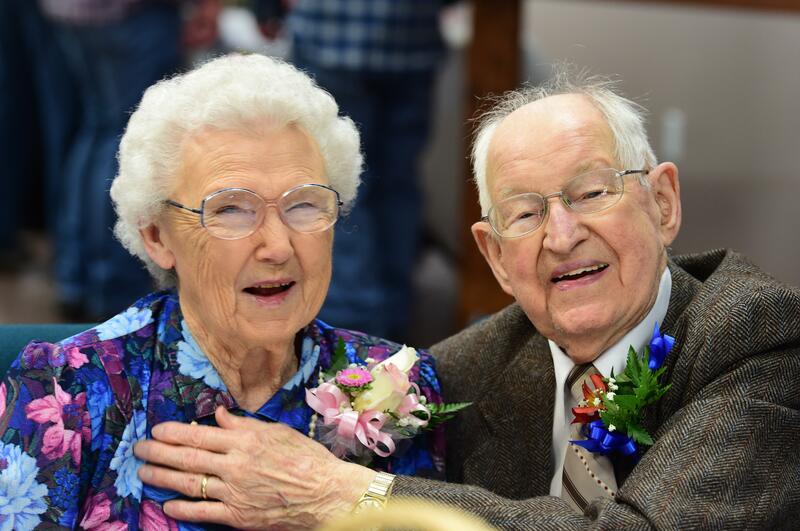 Surrounded by friends, family and churchgoers at the First Free Methodist Church in northwest Spokane, the pair – whose added age clocks in at just under 200 years – swore the achievement wasn’t anything particularly special. This axiom seems to be a theme for these two, who fostered more than 120 children, many of whom were physically or developmentally disabled. They had two children of their own to boot. As the couple sat and ate their pinwheel sandwiches and snacked on pieces of cake, lines of people waited to sneak in, steal a handshake or a kiss, or lean in for a warm embrace. For years, the two have been members of the First Free Methodist Church, where they taught Sunday school. Virginia “Jiny” Denison, a 90-year-old friend known for her famous “Jiny hugs,” remembers the first day she met them. Denison was married twice herself, once for 35 years and again for 21. Her most recent marriage ended when her husband died 10 days before their anniversary. “Of course, that doesn’t even come close to 75,” she said. In addition to fostering children, Harvey owned a barbershop in Hillyard named Harvey’s Shop. Many of the churchgoers would receive haircuts from the retired Army serviceman, including a few of the church’s former pastors. But not James Leman, who’s been pastor of the church for 11 years. His wife chops his hair, and she keeps his short and simple. Still, she has an admirer. “He says she does a good job,” Leman said of Harvey while motioning to his hair. Dale Jorgenson, 54, stayed with them until he was about 18. He remembers helping to look after some of the younger kids and teaching them how to bowl and play softball. Some of his favorite memories in the house, though, were when he got to sing with Harvey.